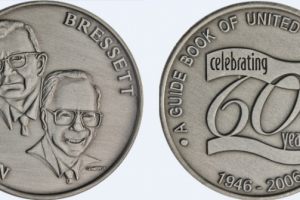 Ken Bressett is one of the most accomplished numismatists I have ever encountered. His knowledge of numismatics starts with the origins of money in the ancient world and spans millennia through the modern coinage of today. He can answer questions about Athenian owls or the recent mintage figures for Presidential dollars. Many of the books Ken has written and edited are still standard references for their subjects. I deeply admire Ken for his interest in the well-being of the hobby over the course of his numismatic career. He has always been an advocate for collectors and served with distinction as president of the American Numismatic Association. Ken has long been closely associated with the ANA, and probably everyone who has ever attended Summer Seminar remembers his sage wisdom being imparted during one of his visits to their class. Ken was deservedly inducted into the ANA-maintained Numismatic Hall of Fame in 1996.